What are some Make & Model names for a mixte style frame? I have been on the hunt for a nice mixte frame for a nice groupset i have. I want something that is not high tensile (although high tensile stays may be acceptable). I have a wtb ad on here, but I have obviously been trying to utilize other sources as well. Not every seller on ebay or craigslist will be familiar with the term "mixte,' so its not necessarily the best term for those sites. Just curious as to some specific makes and models I could be using for search terms that I may not have stumbled upon already. Also, specifically would be interested in knowing stuff that would be made from higher quality steel from those of you more familiar in this area. P.S. If you have something that may be of interest, shoot me a pm! twin top tube style only. Raleigh and Myata are the most common to find, Herse and Motobecane the highest quality I have seen out there. Modern day, Soma and Rivendell are the only production models I have found. The 531 tubed Mixte's are rare but do exist. Although you will find many Japanese Mfg made mixte's, they have their roots in Europe. Google "531 Mixte," you will get a page full! Bikes don't stand alone. They are two tired. 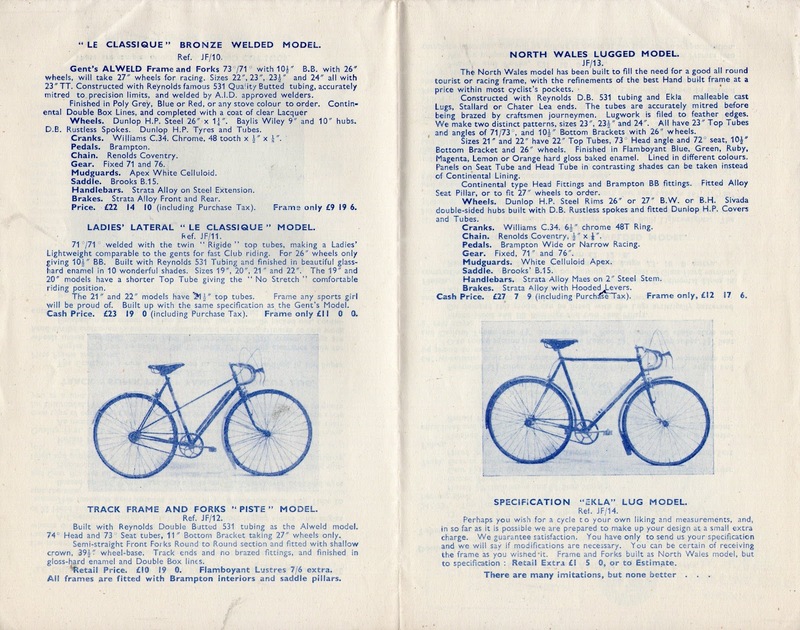 French bike makers were the primary producers of mixte framed bikes. Mixte style bikes were much more popular in Europe than in the US. I estimate that they represented far less than 5% of all of the derailleur equipped bikes sold in the US. I put together this Flickr album a few years ago showing a few mixtes. NONE OF THEM ARE MINE. Gitane, Peugeot, Motobecane, and Bertin were a few of the bigger French makers that made mixtes. The Bertin Cyclotouritse model C117 mixtes were made of Durifort tubing. We imported a few of them during the 1970's and early 1980's. 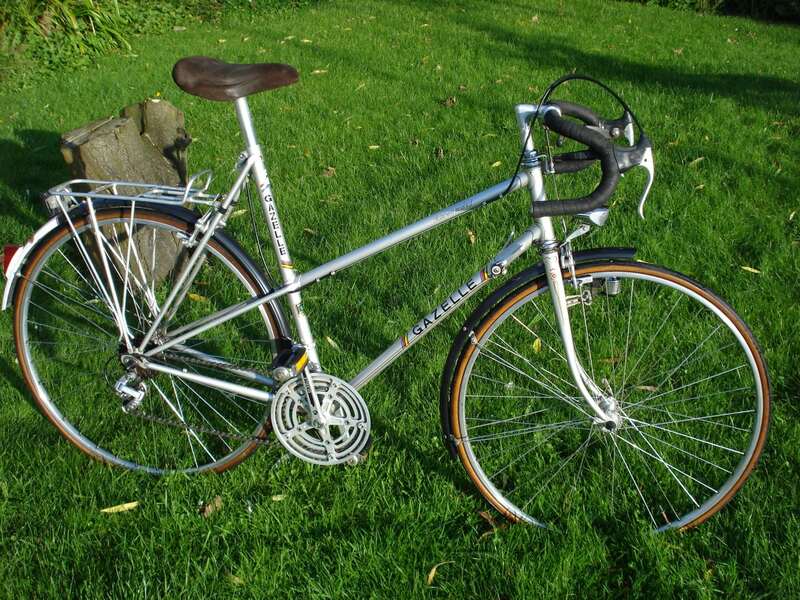 The Gitane and Peugeot mixtes were made of standard low strength carbon steel tube so they are heavier. Motobecane made the widest variety on mixtes ranging from entry level carbon steel models on up. Some of the Grand Touring models had Vitus 172 main tubes; earlier Grand Jubile mixtes had Reynolds 531 main tubes, in the later 70's they were all Vitus 172 tubing. One of the Grand Touring or Grand Jubile mixtes would be a nice find. Raleigh made a few too. 1978 Raleigh catalog showing 2 different models. Centurion and some of the other Japanese brands made a few mixtes too. The Centurion bikes are very nicely made but most of them have frames made of low strength carbon steel. Last edited by verktyg; 11-16-15 at 05:50 AM. Modern and lighter weight is Soma and Handsome's Shedevil that are decently priced. Modernish, Mongoose has their crossway series hybrids from the early 90's. There is a particular year that had a double tube with 4130 tubing it was a low end frame but nice and great to powder coat new. Great Taiwanese built frames, I have a 325 from that era, not a mixte but women's style that is very nice. I have bought and sold many mixtes. Lotus Challenger and Excelle are among the lightest bikes. Miyata and Fuji frames are well built with durable paint. The classic French brand mixtes, Peugeot and Motobecane, are hard to beat for riding enjoyment, whether high tensile or Carbolite, even with chrome rims. Raleigh, Lotus, Centurion, Miyata should all be able to handle upgrades, etc with fairly standard threading and sizes, I'd expect. Puegeot made some really nice (and a lot) of mixtes. There was a year before which they are odd sized, and after which I'm told they're just as standard. Some of the prettiest I've seen are Motobecane. Given my druthers, I'd take a Miyata or Centurion, keep the bottom-pull rear caliper, and upgrade. Mixtes are well-balanced, strong frames, and if a person has been riding a cruiser, re-purposed MTB, or something like that, a mixte with thumb-forefinger shifting, good brakes, and a nice ride sure is an improvement in many cases. There is a small movement to convert some mixtes to single-speed for campus use, etc. Those people are onto a good thing. The best balanced and lightest I've come across are French. What Chas. said. We found a next-to-new Grand Touring at a garage sale this past summer. I'm still tweaking it for my wife, but it looks like a keeper. Fuji made some nice mixtes with butted Val Lite tubing, nice paint and decent components. My wife rides one that I've upgraded with Shimano 600 and 600 tricolor. I have had a lot of Mixte's but I don't think any were made from good tubing, maybe a few Pugs. I found this Astra Mixte the other day and really like the way it looks although it's a low end Motobecane from what I've read. The Peugeot UE-18, the mixte version of the ubiquitous UO-8, and the UE-18, the mixte version of the UE-18 are worth considering in my opinion. Yes, there is the issue of French threading, and some of the Delrin parts may be in need of upgrading. By they are great riding bikes and not too heavy, especially if you replace the original steel wheels with alloy ones. @miamijim had (still has?) a beautiful blue Paramount mixte, iirc. +1 on the Motobecane Grand Jubilee. They are nice bikes. At least some had a quality Vitus tubing. I know where this one is stashed away in a garage, probably to get minimal use for the next 10 years or so. The Grand Touring does share a lot with the Grand Jubilee, but I think it is a slightly lower quality. Still a good bike. The bikes or frames do show up on E-Bay once in a while. You'll have to be patient. As mentioned, Soma, and a couple of other manufactures are making new Mixte frames which would be an option. It looks like the bare Soma frame is about $430, which isn't bad, considering. And don't forget the Fothergill "Le Classique" of the early 50's. "Built with Reynolds 531Tubing and finished in beautiful glass-hard enamel in 10 wonderful shades." Can you beat that? Add Yokota to the mix of mixtes. I have one of those. The only decals left are on the forks, but the frame is very light so I am assuming Tange or Ishiwata tubing. Extremely rare, but Raleigh did make a 531 Super Course Mixte for I think one year in 1973. I remember one popped up on ebay a couple years ago. Bikes: I've lost my mind! I just picked up a Centurian Mixte from someone's trash pile last week. Haven't done anything with it yet. The chrome on the fork tips is pretty shot, but it's all there. Thanks for all the great info!Its already helped find a few i haden't seen before. Searching for a 54-57 cm frame and with a derailleur hanger and with somewhat interesting lugs will be quit the needle i suspect. Could use a claw hanger if necessary. I have been wanting to build a "blingy" mixte for some time now and have a customer who shares the idea, so the search will be worth it. I am a frame away from that. I redid a Mariushi mixte last year for my sister with old deore thumbies and a long cage Shimano Arabesque drivetrain. Was a little small, but a duplicate of that would be perfect. I'll have to get some pictures of that one. Thanks for all the great info!Its already helped find a few i haden't seen before. Searching for a 54-57 cm frame and with a derailleur hanger and with somewhat interesting lugs will be quit the needle i suspect. Finding a larger, quality Mixte may be a bit too much, although I suppose that isn't exactly HUGE, but may be larger than the typical women's frame. And, the more specific about a rare frame, the harder it will be to find. How are you judging the size? The effective top tube for a square frame? Seat tube? You may lean towards a new build. The Soma isn't too expensive, but is mostly tig welded. Here is an interesting thread. Some of the links still work (or can be recovered by jumping to the top level and searching). This Miss Mercian looks nice (with single TT design). Here is a complete set of lugs if you really want to go all-out with the build. Yes, ST/ETT when compared to a square frame. Not in a rush, so will wait for the right frame, I suspect something is out there. Shipping from Europe on Ebay is reasonable often enough. Im aware of the Soma, but would definetely prefer vintage and lugged. I'm more concerned with something in the correct size and interesting lugwork over steel quality in the end. Building it myself would be nice. Im in the process of finishing up acquiring everything i need for brazing (torch, bottles,etc. ), hoping to start building some personal frames this winter. Would still be awhile before I'd think about doing it for the public in any form, but will be nice to try some stuff out! I have been on the hunt for a nice mixte frame for a nice groupset i have. I want something that is not high tensile (although high tensile stays may be acceptable). I picked up a gold Benotto Mixte for my daughter. The frames are gorgeous and lightweight, the components are garbage. You can still find them around for sub $200. I've has few over the years, Paramount and Bob Jackson both in Reynolds 531. Don't know what exactly you are looking for, could not find your WTB post and nothing came up through the search function however this came up on the iBob list and may be of some interest to you.